We've got 25 years remaining: roughly a quarter of the game's timeframe. How are things looking for our country at this late-game date? We are once again a great power, and safely entrenched in 7th place for the time being. Our sphere of influence has expanded once again, and our new modern navy is bolstering our military score enough to help maintain our power status. 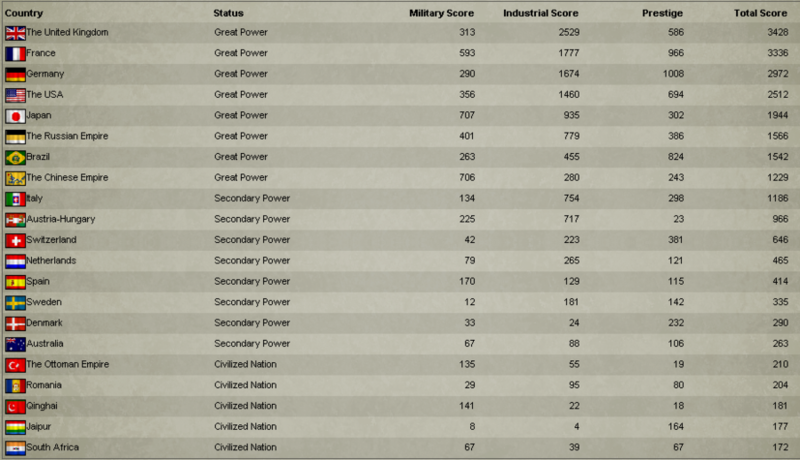 Our total score ranks us roughly the same as The Russian Empire with a few hundred points worth of breathing room between the 8th place great power and secondary powers. It's safe to assume that we'll fluctuate between 6th and 7th in overall ranking for a while, but the total rankings of stronger great powers get exceptionally high further up the list and so I don't see a quick path to the top for us. The nature of our industry hasn't changed much since last time, though it has grown in size. Mostly we produce consumer goods, with some seasonal success with small arms factories, and an inexplicably successful artillery industry. 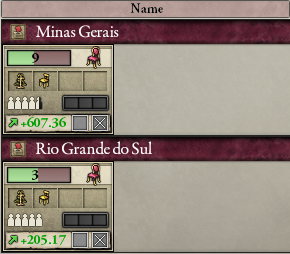 I wanted to show off our very profitable luxury furniture factories here. These are the biggest moneymakers among all of our factories. The costs of maintaining a modern navy and a large, well-equipped standing army are large. Access to coal is a problem for us, and our battleships need it for maintenance. I'm looking to replace our battleships with the even more powerful dreadnoughts as soon as possible. Those actually use fuel rather than coal, and the market for fuel seems much more accessible right now. 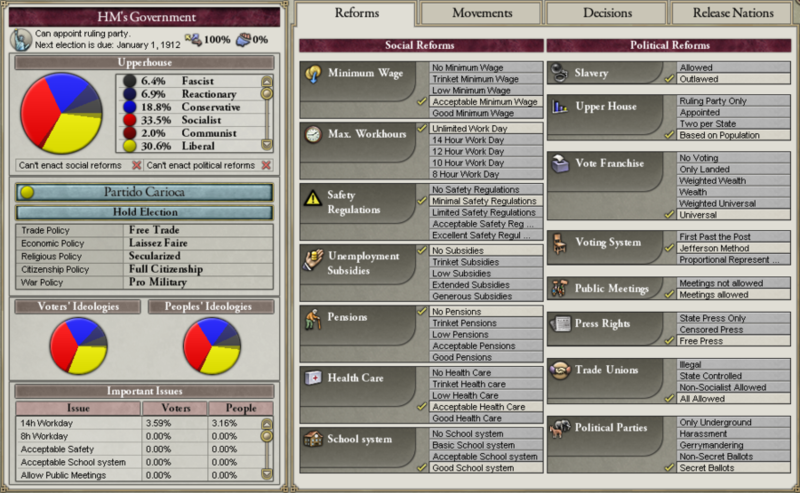 We're also at the point where I am ready to turn our education slider down to about 50% for the rest of the game. Our literacy is around 95% and we're a technologically advanced nation. There's no need for us to promote clergy growth so heavily at this point. My recent focus on warfare prompted me to catch up with our army and navy technologies. Previously those trees were lacking, but now we have one of the most modern militaries in the world. There really isn't a particular area where I can say that we're far behind in. 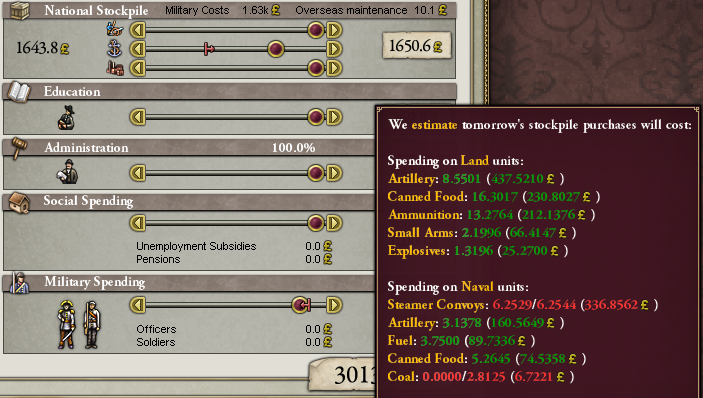 My next priorities are to finish research into naval technologies, then to squeeze the last few points of input and output efficiency for our factories out of the commerce tab. Filling out the 'psychology' tree isn't really the worst thing to do, but for some reason I've particularly neglected it in this game. It raises the 'starting experience level' of our troops, and allows them to replenish more quickly after suffering losses. There continues to be a large shift towards socialism in our population. 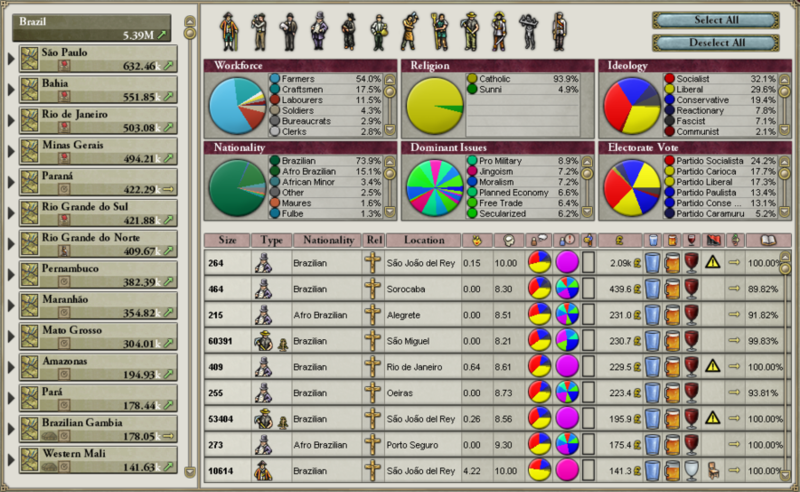 Many social reforms have been passed by this point, and in order to keep our people as happy as possible I just enact whichever reform has the most support in the movements tab whenever given the opportunity. 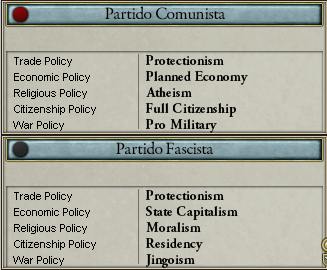 We've had both Communist and Fascist parties become active in our country over the past decade, but the influence of each group is minimal. Much like Reactionaries are the radical form of Conservatives and Anarcho-Liberals are the radical form of Liberals, Communists are treated as the radical form of Socialists. Fascists are a bit different in that they aren't a radical version of another party, they are just out there on their own. Fascists basically attract really angry, confused people with a particular mix of ideologies who would otherwise be a member of another radicalized party. The state of São Paulo continues to grow rapidly, becoming our highest population state. Our capital province of Rio de Janeiro remains the single most populous province, though. The workforce demographics show that over 20% of our nation is employed by factories now, including craftsmen and clerks. 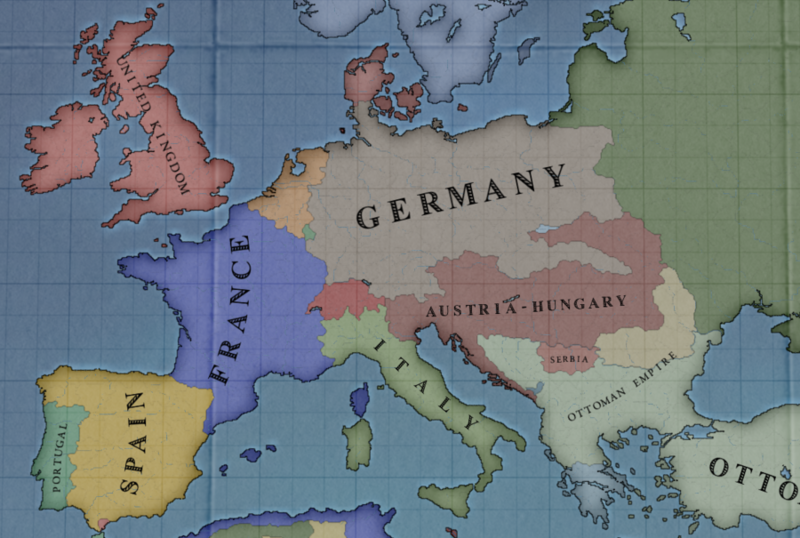 Germany has grown considerably, taking Alsace-Lorraine from France, Slovakia from Austria-Hungary, and Poland from The Russian Empire. France continues to hold onto it's acquisition of Catalonia as well. It's likely that this scenario will result in another Great War sooner rather than later. 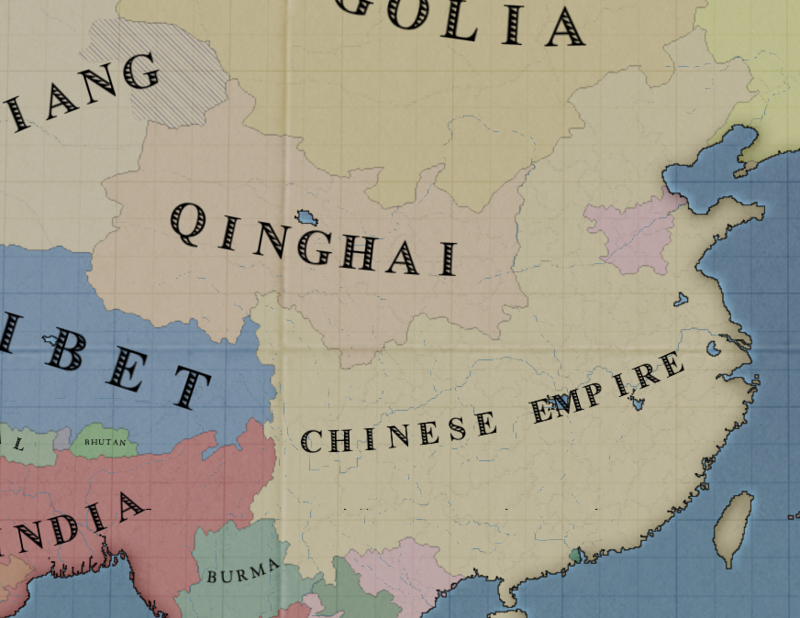 China's emergence as a great power is worth noting, as well. They've taken many of their former sub-state regions by force, creating a massive unified state. As their technology and industry grows, they'll become much more powerful. Japan's status as a great power and its holdings in Indonesia and mainland China means that a conflict between these two nations is inevitable at some point, too. If this conflict draws the interest of great powers in Europe, then there could be another Great War rooted in territorial disputes between China and Japan.